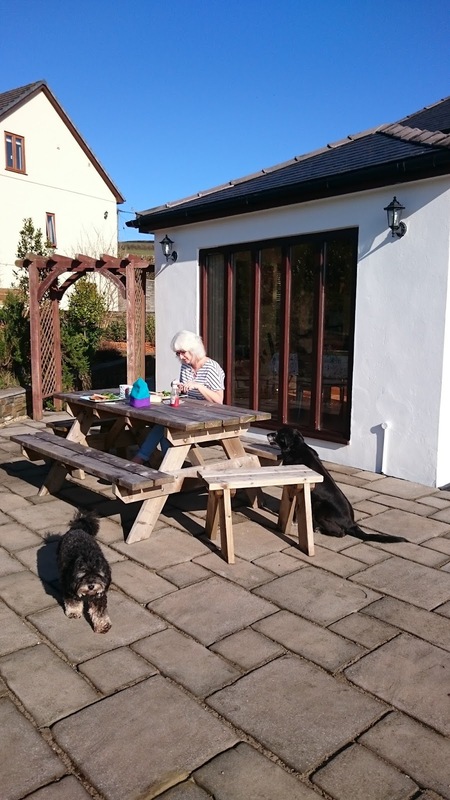 We were looking for a house sit over the Easter long weekend and found a lovely place - looking after a barn conversion plus two dogs, two cats and some chickens on a 6 acre small holding, not far from Carmarthen and a short ten minute drive to the beach - perfect. 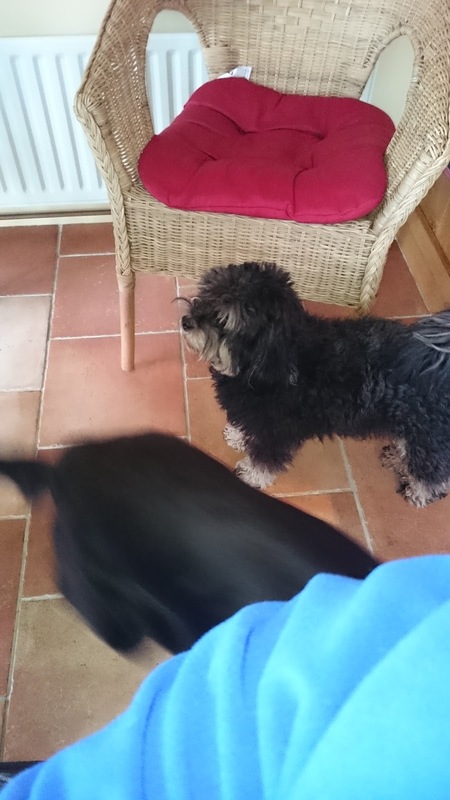 I contacted the owners via the Trusted Housesitters website and a few days later we had a chat with them on Skype. Originally there were also a couple of rescue ponies too, but they were rehomed by the RSPCA just before we arrived. We decided to take Nido, our campervan. 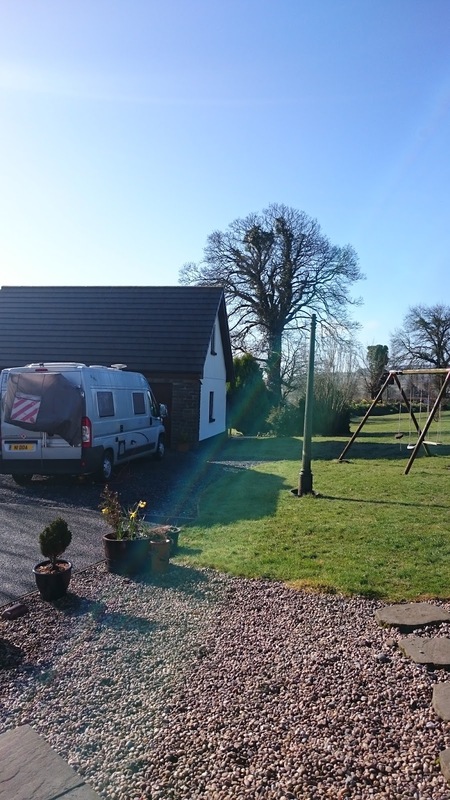 Although there was a room for us in the house, there was also space on the drive for the van, with electric, plus we could use the van for any day trips. So we decided to use the house during the day but sleep in the van. We were both working today, although I worked from home in the morning and had taken the afternoon off. I collected the van from the storage site at around midday, which gave me plenty of time to water and fuel up, load up our clothes and food and give him a good clean. Cathy arrived home at about 4pm and we were on the road soon after. The roads were quite busy as it was the start of the Easter long weekend. Our route took us through the centre of Wales along the A483. This is mostly single carriageway and winds up, down and around the hills, so in the dark and rain the drive down this unfamiliar route was 'interesting'. At one point the top of a pass was thick with fog and on a few occasions, to ease the stress and rest my eyes for a short while, I pulled over to let the cars queueing behind pass me. We arrived in the village just after 9pm and I parked up by the pub to walk out and find the house in the dark. Luckily one of the owners was looking out for us, so having said hello I drove through the gate and parked up in front of the garage building. Once hooked up we popped into the house to meet the owners, who were very friendly and well prepared for a new set of house sitters. The tea and cake were very welcome and we sorted out the house handover, plus cat and dog feeding routines. After a long day and as it was now very dark outside, we decided to do the rest tomorrow morning and returned to the now warm van for a welcome sleep. The next morning we woke to clear blue skies and bright sunshine - lovely! This was especially welcome as the last two weeks at home had been nothing but thick grey cloud. I made us a brew and sat outside, fussing the dogs, until Cathy was up and dressed. We walked up to the chicken coops to learn the feeding and cleaning routine, then a cuppa with the owners to finish off the handover before they left for their own trip away. 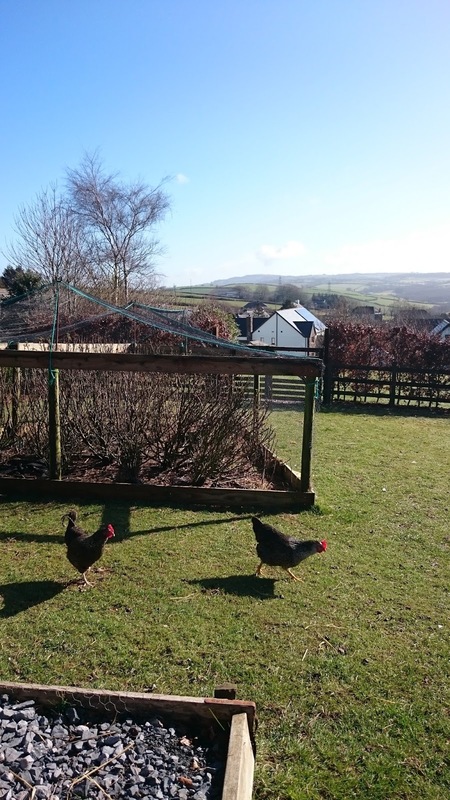 We made the most of the welcome fresh eggs, cooking these with spinach and toast, eaten outside in the warm sunshine enjoying the view over the hills and countryside. We had a play with dogs Sunny and Bubbles before locking up and driving out to make the most of the good weather - the forecast for the rest of the weekend was pretty dire. The owners had kindly left us a parking permit for Pembrey Country Park. We drove down and into this lovely area, a mix of large grass areas, pine forest and dunes, leading to miles of sandy beach. There were various car parks dotted around and we pulled up in one behind the dunes. It was sunny and warm so out came the shorts! There were a few people out walking, some with dogs. The tide was out so it felt like we had the huge beach all to ourselves. 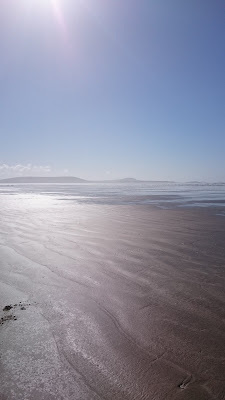 We walked east, towards the Gower peninsular in the distance, Cathy collecting some lovely oyster shells of various colours. At the far end we reversed our route and walked back along the tide line, picking up a few more shells and some small, smooth pieces of driftwood for our garden. The first skylarks of the season could be heard but not seen. However, near the end of the walk one flew up and held station only about 10 metres high - a lovely song. 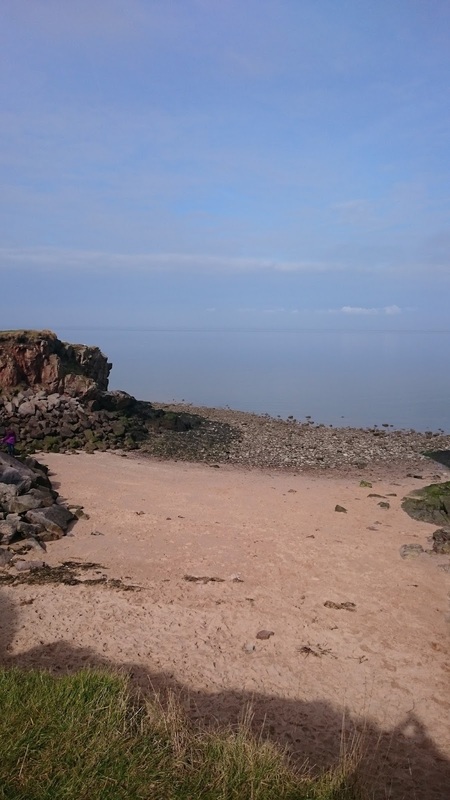 We really enjoyed being back by the sea again (it's where we belong!) and returning to the van our faces were glowing from the sun and wind. Back at the house the dogs were pleased to see us and we had a bit of a play with them - Bubbles didn't want to let go of his tennis ball until he spotted some of the shells Cathy collected; he particularly liked the whelks for some reason! The sun was still shining brightly and it was lovely sat outside, sheltered from the breeze. We enjoyed a brew before heading indoors to cook some food. The rest of the day was spent relaxing, playing with the dogs and enjoying the peace and quiet. Once the dogs had been fed we watched some TV until it was time to put the chickens to bed for the night. The dogs had a final wander outside before we locked up the house and returned to the van. The sky was clear and the stars amazingly bright thanks to the lack of artificial light - what a lovely place. Any scraps for a hungry doggy? We woke to grey skies and increased wind - outside I mean! I was first up and fed the dogs before letting them out for a run while I checked the cats' food and water. 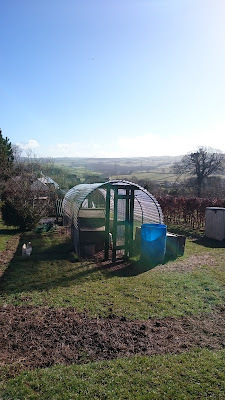 Next it was the chickens' turn - coops cleaned, food and water refreshed and letting them out to roam around (except for one that has a leg problem so needs to be locked in for its own safety). Back at the van I made us a brew, then we went into the house to enjoy our breakfast - more fresh eggs! By now the expected rain had arrived and this became increasingly heavy during the day, as the wind also strengthened. So today was an 'in' day, catching up online, reading and just chilling. Even with the poor weather, we enjoyed looking out over the hills as the clouds and rain rolled in from the south west. Lunch done, we continued to watch the rain, which finally eased later in the afternoon. Sunny and Bubbles were grateful for their evening feed. For us, I'd made a chicken and veg stew which had been slowly cooking on the hob and we enjoyed this with some red wine. By now the sun was setting so it was time to put the chickens to bed. Cathy and I rounded them up. They'd laid us three eggs, all different colours, as if they'd been especially dyed for Easter; we'll enjoy those tomorrow. Cathy washed up while I enjoyed a hot shower, then we settled down to watch some TV with a brew. 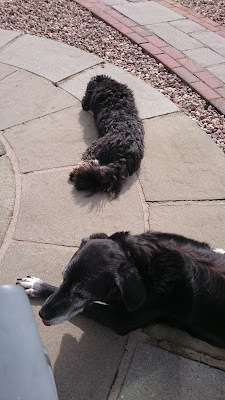 The last job was to let the dogs out for their last run, then move the clocks in Nido forward one hour ready for BST. Bubbles did his usual disappearing act, legging it off into the darkness and returning half an hour later! I'm hoping to get out on the road bike tomorrow... if the weather holds. Happy Easter! I'd bought Cathy an Easter egg, but she started on it last night, so it'll have to be real fresh, free-range eggs again for breakfast! It was windy and rainy in the night. I was first up, flicked on the heating then dressed and went into the house to feed the dogs and cats. As usual the dogs were ecstatic to see me (cupboard love!) and the cats aloof. With them fed, watered and fussed it was the chickens' turn. Finally, it was Cathy's turn to be pampered - tea and choccie biccies in bed. I'd hoped for a bike ride today, but it was cold in the blustery wind with the occasional sharp shower and I hadn't packed inclement weather clothing. So we decided a walk would be better for the conditions. Whenever we do a housesit in a new area I buy the relevant Ordnance Survey map, so I worked out a circular walk. Cathy had a little trouble getting ready as Bubbles had taken a liking to one of her walking socks! I saw him trotting across the patio towards the house with it in his mouth - he's a right character and the older Sunny turns her nose up at him - she just wants a tummy rub and food! Socks recovered, we headed out past the pub and into the fields. The ground was quite heavy in places, the first half being mainly across the fields and hills and the return on small country lanes. It was windy all the way around but at least the rain stayed away, so our faces were glowing from wind burn and some sunshine when we returned. Back at the house we had tea and cake (why not!) and Cathy went off for some 'Egyptian PT' (aka a snooze!) while I made some vegetable pasta sauce and watched the Oxford/Cambridge boat race. The Oxford ladies won and the Cambridge crew did well to even finish considering their boat nearly sank in the choppy conditions. But the Cambridge men pulled it off - the better team obviously! The pasta sauce is for the home owners. I always like to leave something if I can. They might not get home until late, so at least they can warm up the sauce and cook some pasta with little effort. 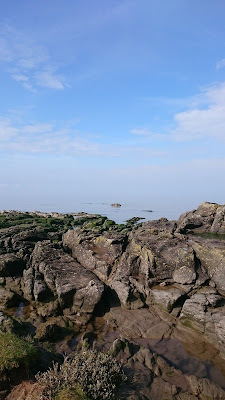 The sun was shining but it was really chilly in the stiff westerly wind, no doubt cooled by the sea which isn't far away. So I dipped in and out, playing with the dogs and popping back in to sit at the sunny kitchen table. Cathy finally emerged from her slumber and went off for a shower before settling down to read. I did similar and brought some food over from the van to eat later - a simple salad with some cold meats. I also found a bottle of gin and some tonic in the van - rude not too - and it was nice to celebrate the first light evening of British Summer Time, sat in the peace and quiet of the house. This place is lovely. 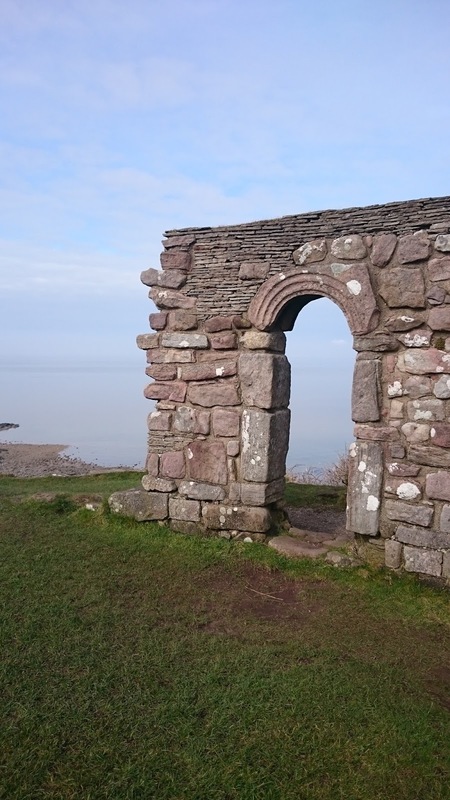 It was originally built in the 1680s as the Tythe barn for the village church, which is on the opposite side of the road. 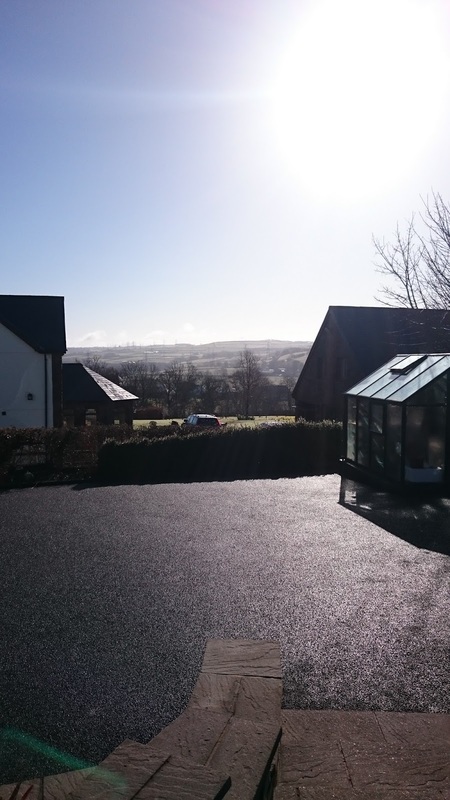 It has had various storage uses over the years, but this conversion has been completed very sympathetically and to a very high standard. 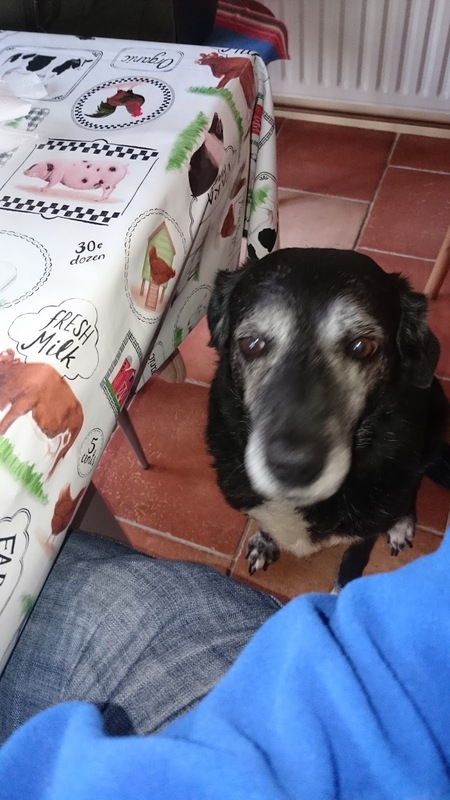 We feel lucky to be able to look after it and the animals for a few days - one of many such gigs on the Trusted Housesitters website. Whereas Bubbles just wants to play ball! Last night Storm Kate hit the south coast. We had a lot of wind and heavy rain but we woke to bright sunshine, albeit still a chilly wind. First priority was feeding the dogs, cats and chickens, plus a bit of mad run around with the dogs. Bubbles like to chase a tennis ball but he doesn't like to let it go, so we only get to play it once! In the meantime Sunny just likes a tummy-rub. We had breakfast inside the house before cleaning up and readying Nido for the off. One last cuddle with the dogs (and a little treat! ), house locked up and we headed off. We have some friends - Dave and Angie - who live near Llandrindrod Wells and we had arranged to stop off on the way for a catch up. Dave and Angie were also in the Royal Navy - same branch as me - and I've always kept in touch with them. It was great to catch up and they kindly provided a lovely lunch. It was great to see their bouncy dog - Fudge! 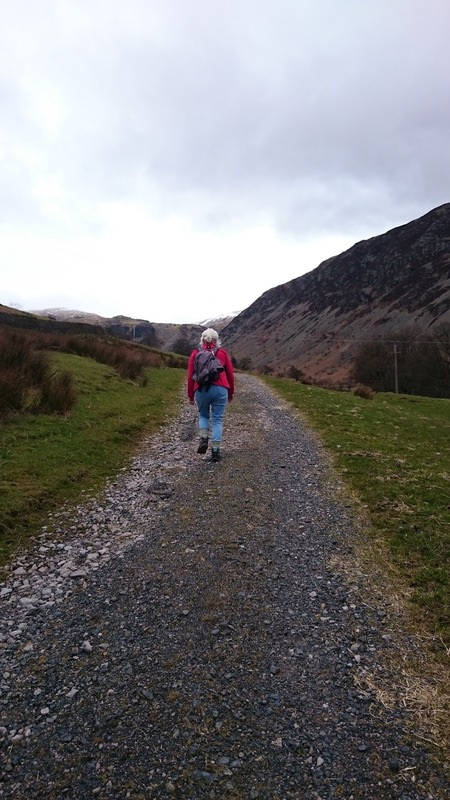 Dave and Angie are retired and their passion is hill walking - they have a great website called Marsarnen Ramblers where they record all their walks, well worth a visit. Well fed and watered and after a good chat (kindred spirits) we left them to take Fudge out for a walk and continued our drive north. Back home, we cleaned and emptied the van before I returned him to storage. It's been another great house sit. 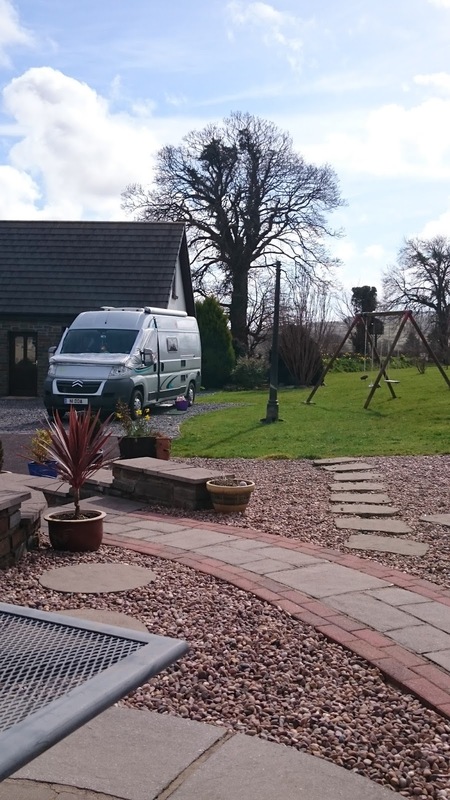 The owners were very friendly and extremely organised and we really enjoyed looking after their beautiful house and lovely animals. It's been well over two months since we spent New Year in Wales in Nido. It's felt like a really long winter and we were more than ready for a trip away in the van. So this weekend has been a long time coming. 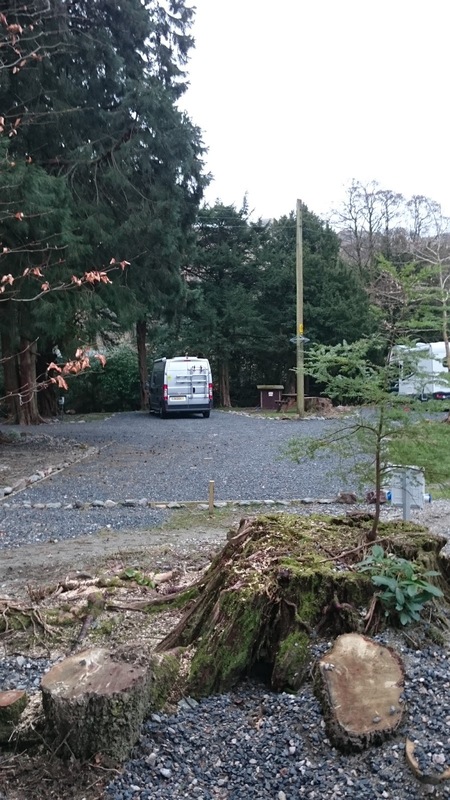 I booked the CL at the Patterdale Hall Estate last week; five pitches in a quiet area of the Lake District near Ullswater. I finished work at midday and at home Cathy had already packed up her car, so we we quickly turned around to drive up to the storage site. It was a dry and sunny afternoon, so loading up was easy, although the water had been switched off, which prevented me filling up the tank. So I drove back home to top up, while Cathy unpacked on the drive. At the end of our New Year trip I emptied all the tanks, including then boiler, so all of these also had to be primed and cleared of air in the pipes. We were soon on the road, heading north up the M6. The traffic was kind to us and we followed the directions in the Caravan Club book, ignoring the satnag. This was just as well as Cumbria was still recovering from the dreadful floods just before Christmas and many of the roads were still down. We followed the diversions, gradually chilling out as we drove, with snow-capped hills all around us. We passed through Glenridding, which was hit particularly badly in the floods; I remember seeing the village on the TV news at the time. Just outside the village we turned off opposite the Patterdale Hall Estate. The CL is set amongst trees, all hardstanding with electric hook up and a picnic table alongside each pitch. 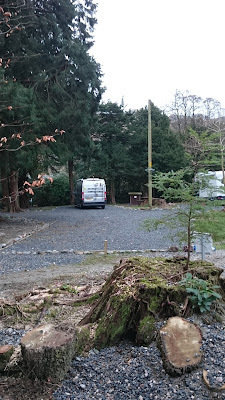 Two vans were already on site and we pulled into a free pitch, overlooking the beck - it's a very peaceful spot. I sorted out the electrics and the insulated silverscreens across the windscreen, while Cathy made up the bed and finished the last of the unpacking. Finally we sat inside with a brew, sharing an Aldi 'twix', listening to the beck and the birdsong - lovely! We fancied a leg stretch so took the short walk into Patterdale, passing the church and hotel before coming upon the White Lion Inn - result! It's a cosy village pub and we sat in the warm, me with a pint of White Lion Pale Ale and Cathy with half a Heineken. A couple of people were inside waiting for food and when it came out the portions were generous - I think that's us sorted for tomorrow night! Back at the van, we sat in the cab seats chatting with a glass of wine and some nibbles, while a bacon and gruyere quiche warmed through in Oska, enjoyed with a green leaf salad. Washed up, we enjoyed a brew and a chat before giving in to tired eyes after a long day. With the sound of the beck outside and not much else, I'll think we'll sleep well tonight. We're looking forward to a day of hill-walking tomorrow. Despite the peace and quiet, we both had a bit of a restless night. I remember being awake at about 0330, listening to the resident owl. Cathy was also awake, so we took the opportunity for a loo visit! 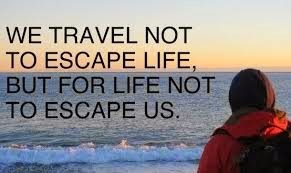 Although it's next to our bed, it means one of us has to clamber over the other to get out - not easy at our age - so if we're both awake we can synchronise! We were both awake by about 0730 and I got up to flick on the heating, then dressed and went off to ditch the gash. Breakfast was cooked outside on Oska - egg and bacon 'jack-muffins' - like McMuffins but cooked by an ex-matelot rather than Ronald McDonald! In the meantime Cathy prepared our packed lunch. 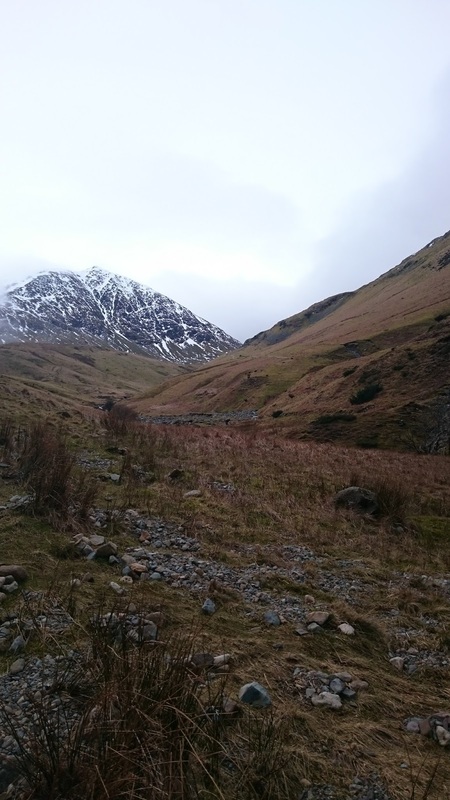 All washed up, we packed rucksacks, donned walking boots and coats, locked up and turned left onto the main road towards Glenridding. This was a short 10 minute walk and as we approached the village it was clear how devastating the December floods had been. The sides of the beck were being rebuilt and some of the hotels, pubs, businesses and homes were still deep in renovation - it must have been dreadful for all those affected. 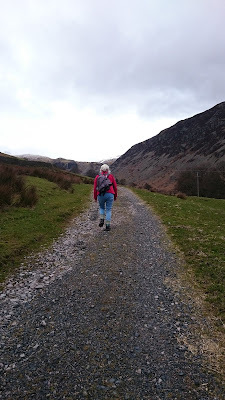 The footpath we had planned to use had also been washed away in the floods, so we followed the detour and were soon walking around the hillside, with Glenridding Beck down to our right. 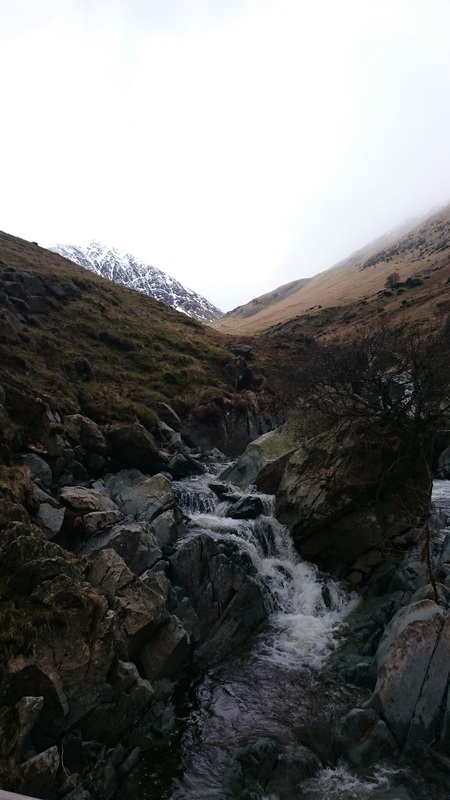 As we contoured around the hill, the snow-capped summits of surrounding hills and mountains came into view, particularly Catstye Cam, which was covered in snow, with the summit lost in low cloud and fog. Although our walk offered a climb to the peak, it was clear we wouldn't be up there today. We continued to follow the beck, before starting the ascent up towards Red Tarn, with Helvellyn in the distance. The local mountain rescue teams were out, practising with their very enthusiastic search dogs, who clearly enjoyed finding the 'casualties' hiding in the nooks and crevices, in exchange for a play with their ball in reward. We continued to climb. 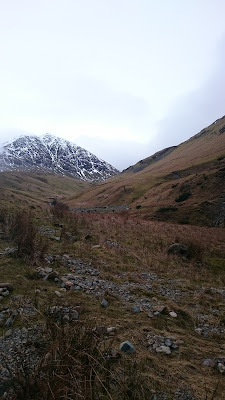 The clear track now had some snow patches around and we soon reached the snow line. By now it was cold, windy and the visibility was increasingly reducing. At the point we started to walk on snow, vis was down to about 50 metres. Although we were wearing walking boots, they weren't all season, plus we didn't have our walking poles. 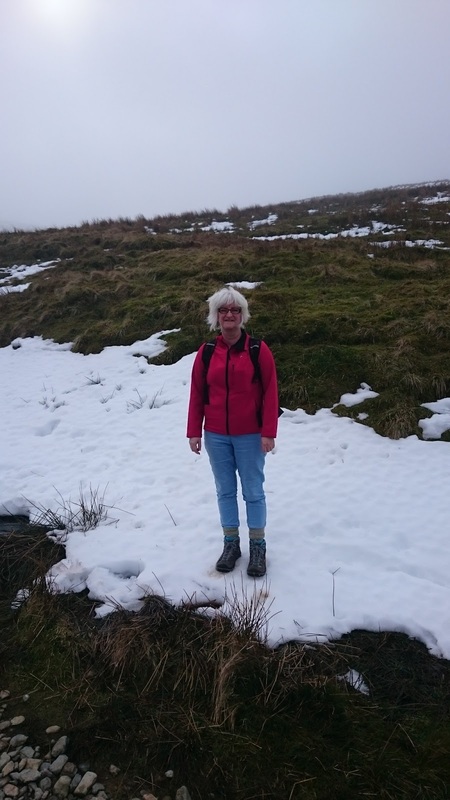 With visibility reducing fast and wind increasing, plus this being an unfamiliar walk, we took the sensible decision to stop climbing just before we reached Red Tarn and return the way we had come. Dropping back down to the beck, we found a spot by the river to enjoy our lunch - the hot tea was very welcome. Back in Glenridding village, we bought some naan for our curry. Originally, we'd planned to eat out tonight after a tough walk. Even though we still walked as far despite turning back, we felt we hadn't achieved our aim, so decided to cook in the van instead. Back at Nido, Cathy made a brew while I unpacked the rucksacks and put away our boots. We both had a welcome shower before Cathy had a stretch and read on the bed. I prepared dinner, using a curry mix Nicola and Chris bought me last year for my birthday. This Rogan Josh mix was called 'The Spice Tailor' by Anjum Anand. We have her curry recipe book at home and it's excellent. This mix has whole dried spices plus two sachets of sauce. I used chicken breast, bulked out with onions, garlic, ginger, green pepper, mushrooms and broccoli - all cooked in Oska, with the naan wrapped in foil and warmed on top. During the prep, while hunting out some cumin seeds to add, I discovered fluid in the bottom of our spices box. It had come from the Halen Môn salt we bought last year. Unfortunately this is packed in cardboard tubes with a plastic lid - if you remember the old smarties tubes you'll know what I mean. Over the cold winter break the damp had soaked through the cardboard and the salt was damp. Hopefully we can dry it out and save it. 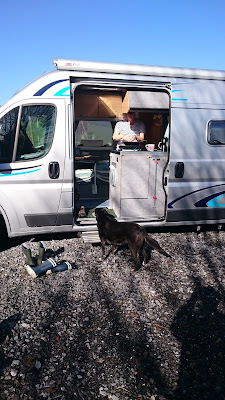 Full of curry and warmed up, washing up done and blinds closed, we enjoyed the cosiness of the van, finishing off some wine, followed by a brew and some chocolate cornflakes. 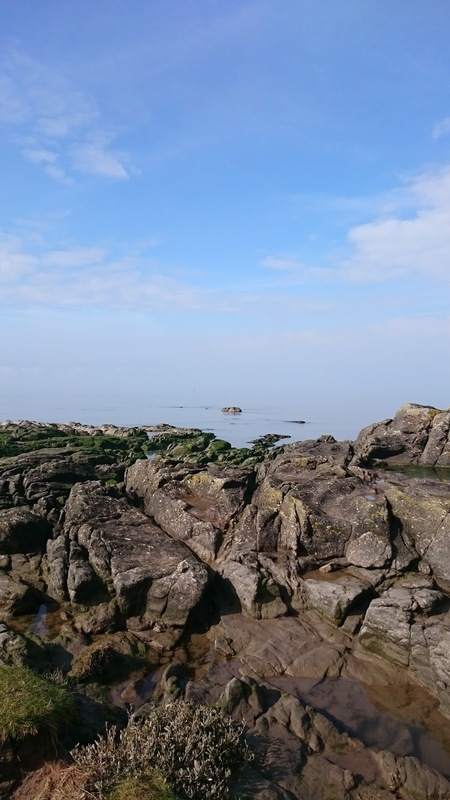 Tomorrow we plan to visit a part of the coast near Morecambe, as we head south towards home. In the meantime we're sat in our warm oasis, enjoying the peace and quiet, ready for the owl's nightly visit. We both slept well and woke quite early to birdsong and another dry morning. After breakfast we got in with our respective jobs - Cathy inside and me out - and by 0945 were on the road, heading south through the Lakes, past Windermere and towards our next stop. Our National Trust book showed a historic site in the village of Heysham, by the beach. We parked in the large village car park and walked down a small lane lined with old fishermen's cottages to walk for a short while along the coast, before turning back and past the church to the ruins of St Patrick's Chapel. 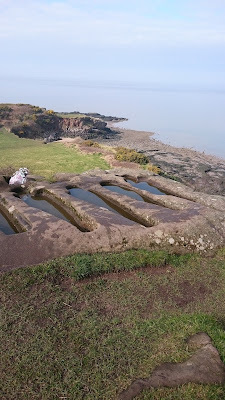 The ruin dates from the 8th or 9th century are and is built of sandstone. Near the chapel is a group of six graves cut into the solid rock. The sun was starting to break through and with no wind and a very calm sea, it was turning into a lovely warm day. We walked down to a small beach and, because the weather was so nice, went back to the van to make some tea and pack a picnic, before heading back to a small rocky area with a stretch of dry, soft sand. A few guys were fishing - and catching - gradually moving back off the rocks as the tide returned. We enjoyed our food sat in the warm sunshine and had a mooch around the small beach. Cathy found a few pieces of sea glass - pieces of clear and coloured glass that had been weathered smooth in the sea. Once we saw one piece we saw them everywhere. This beach stop-off finished off a relaxing weekend. Yesterday we had our boots in the snow and today they were in the sand! 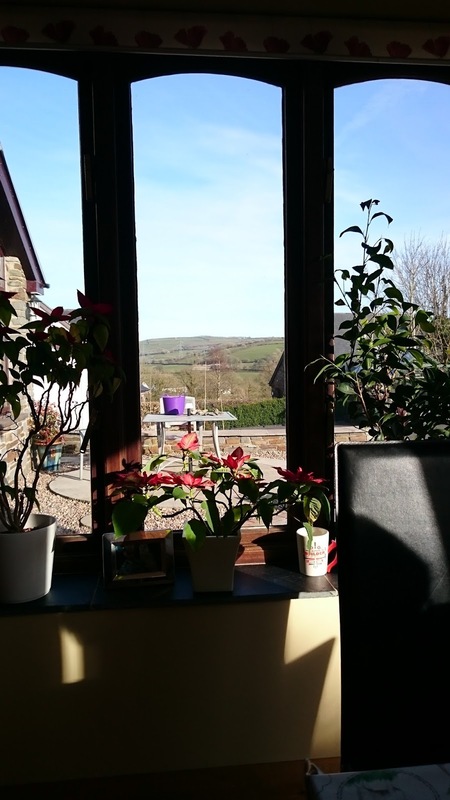 Our next trip is to Camarthen over the Easter weekend, when we'll be house-sitting for a family, looking after their home, smallholding and pets.